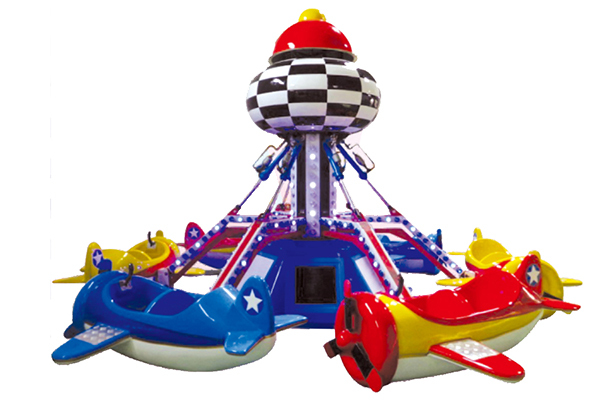 Self-control plane is very popular in the theme park amusement park and also shopping malls. almost every kids love to play it. it iscomposed of mechanical, pneumatic and electric system, is a kind of vertical axis center rotate, lift amusement equipment. The plane around the center rocket or other adornment modelling rotation or lift . Tourists in flight hold lever lifting at random, chasing and shooting each other, realistic sound effects make people excited. Self airplane have good performance, simple operation, novel appearance, luxuriant charming lights decoration,welcome to our factory to experience it.